The Setup: Bart is skateboarding through town when Mr. Burns hits him with his car. A Work In Progress: This episode is the first appearance of infamous lawyer Lionel Hutz, voiced by Phil Hartman, as well as Dr. Nick Rivera (though without his trademark "Hi, everybody/Hi, Dr. Nick!" schtick) and the Blue Haired Lawyer often employed by Mr. Burns. The Devil also appears on "The Simpsons" for the first time. Fun Fact: After being struck by Mr. Burns' car, Bart finds himself in Hell. 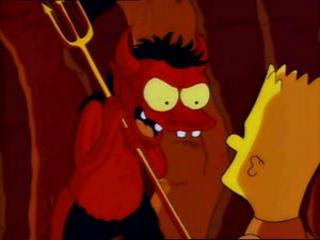 The Devil tells Bart he's "not due to arrive until the Yankees win the pennant. That's nearly a century from now." This episode originally aired in 1991, during an uncharacteristically-long championship dry spell for the Yankees. In 1990, they finished the season with the worst record in the American League. However, the Devil's "nearly a century" estimate proved to be a bit off: the Yankees won the American League pennant (and the World Series) in 1996, and won the pennant again in four consecutive seasons (1998-2001), as well as the World Series in 1998, 1999 and 2000. Hutz: How does a nice little girl like you know a big word like that? Hutz: Mr. Simpson, the state bar forbids me from promising you a big cash settlement. But just between you and me, I promise you a big cash settlement. Bart: It was a beautiful Sunday afternoon. I was playing in my wholesome childlike way, little realizing that I was about to be struck down by the Luxury Car of Death. Teebore's Take: Back in the long, long ago, in the time before DVDs when I videotaped "Simpsons" episodes so I could watch them again and again, this is one of a handful of episodes I somehow managed to never get on tape. 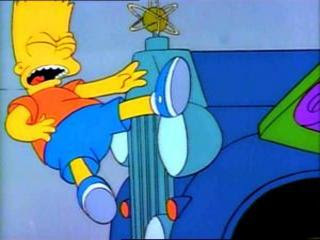 I wasn't missing much, as "Bart Gets Hit by a Car" is a standard season two episode: funny, with a standard sitcom plot (courtroom antics) and the hint of a moral (Marge destroys Homer and Lionel Hutz's fabricated case when she refuses to lie in court). 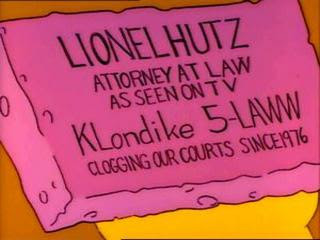 Highlights of the episode include the introduction of Lionel Hutz, one of Phil Hartman's two great characters on the show (and my favorite of the pair), the dueling narratives of the car accident as presented by Bart and Mr. Burns, and Bart's unconscious journey through Heaven and Hell, culminating in his first meeting with the Devil. A solid if unspectacular episode that gains extra points for the introduction of classic supporting character Lionel Hutz. I remember seeing this episode about twice in my life. They just never seemed to replay it. But would this mark the first "Simpsons almost strike it rich but blow it in the final act" episode? Or did I forget about an earlier one? Yeah, I think we can call this the first official "Simpsons almost strike it rich but blow it in the final act" episode. Which is fitting, because it is a very sitcom-y episode overall. At one point or another, just about every sitcom is going to do the "character(s) go to court, wacky hijinks ensue" episode, and this is "The Simpsons" contribution. I would also have to agree that this episode simply must not be replayed very often, for whatever reason, which is probably why I never got it on tape back in the day.